In May of 2018, I graduated from the Virginia Military Institute. I walked away from what I believed was the most transformational four years of my life. I had given up a lot to be at VMI – my social life, my hair, the normal college experience – but in return I received so much more. I learned to love challenges, to embrace the process, and to always step out of my comfort zone. It has been months since I donned the VMI uniform, but I still cling to these principles and I still seek not-so-ordinary expeditions in my daily decisions. I believe these values that I developed at VMI helped me make the decision to come to the Raymond A. Mason School of Business straight after I graduated as an undergraduate. I was an unlikely match for this program. I was an English major with no more than a summer’s worth of part-time work experience who had a terrible phobia of math. I had seen very little of the world and had very little life experience. In comparison to most thriving MBA students, I lacked a lot of internal merit that makes a well-rounded candidate. These shortcomings, however, did not stop me from applying in the spring of my senior year of college. After a long talk with the business school’s amazing admissions team, I felt that this program aligned perfectly with what I wanted to achieve following graduation. I knew William & Mary’s School of Business would challenge me in ways I had never been challenged before, and this excited me so I decided to enroll in the fall. Writing this with a semester behind me, I could not be happier with my decision to start a Master’s degree straight out of college. While this program has been rigorous at times, there have been many assets that have made it immensely valuable and worth it for me. While I am currently in the minority when it comes to my age and experience, I believe that my circumstance has allotted me a unique approach to this program. I have been able to absorb so much from my talented peers and have enjoyed listening to their life experiences. I have come to find out that the MBA cohort acts as a network in itself. With so many varying backgrounds enlisted in our class, there is always someone available to answer questions or make connections. I have learned that taking the time to connect with those around me has taught me just as much as the material in the classroom. Not only have I learned a lot, but I have also come to find my own background has a unique leverage in the overall market. In October, I attended the National Black MBA Association Conference in Detroit, Michigan. MBA candidates from across the country attend this annual event in hopes of landing a job or internship with global competitors. I signed up with hopes that face-to-face interaction would compensate for my young and inexperienced resume. My strategy worked, as I was able to secure an internship within a week of the fair. I found that many recruiters enjoyed the energy and optimism that comes from younger MBA candidates and they looked at my dedication to a Master’s degree as a character trait. Weaving my experience in the program with my story has benefited me as it has served as evidence to my desire to excel. 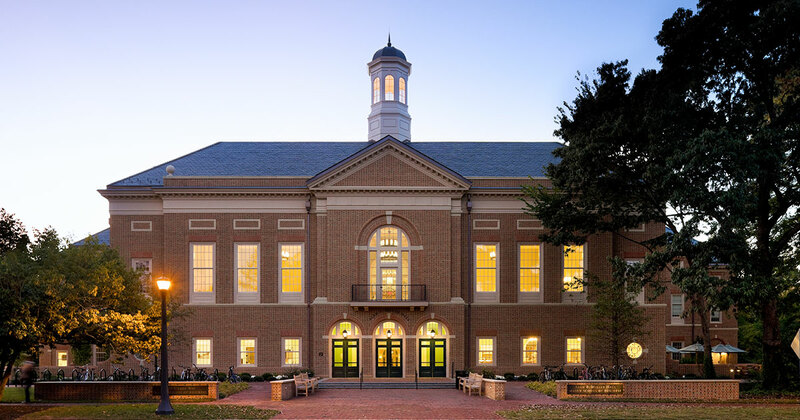 For those who are considering a full-time MBA program directly after their undergraduate career, I would highly recommend William & Mary. This school has become my home in mere months and I have found success in all aspects. As mentioned before, this program has delivered its own set of challenges, but only challenges that provide great satisfaction when surpassed. I have never once looked back on my decision to jump into unfamiliar territory, and I cannot wait to see what lies ahead in the upcoming months! Carlee Anderson is a first-year MBA candidate at William & Mary's Raymond A. Mason School of Business. She is a graduate of the Virginia Military Institute, class of 2018, where she earned her undergraduate degree in English and played on the varsity soccer team. Carlee's short-term plans include completing her spring classes and starting her internship with Eli Lilly during the summer of 2019.